Watch Gary Hamel, celebrated management thinker and author and co-founder of the Management Innovation eXchange (MIX), make the case for reinventing management for the 21st century. In this fast-paced, idea-packed, 15-minute video essay, Hamel paints a vivid picture of what it means to build organizations that are fundamentally fit for the future—resilient, inventive, inspiring and accountable. "Modern” management is one of humanity’s most important inventions, Hamel argues. But it was developed more than a century ago to maximize standardization, specialization, hierarchy, control, and shareholder interests. While that model delivered an immense contribution to global prosperity, the values driving our most powerful institutions are fundamentally at odds with those of this age—zero-sum thinking, profit-obsession, power, conformance, control, hierarchy, and obedience don’t stand a chance against community, interdependence, freedom, flexibility, transparency, meritocracy, and self-determination. It’s time to radically rethink how we mobilize people and organize resources to productive ends. This video is an excerpt from the University of Phoenix Distinguished Guest Video Lecture Series. A must see for all leaders! But more, this is a must UNDERSTAND and ACT ON! Thank you so much for having come up with a marvelous piece of communicaton. The quality of this presentation is a new standard in term of web innovation and education. The educational content and emotional impact will continue to help trigger more new belief and vocation! I have already watched it several times and continue to discover new perspectives. Wow. Fantastic video. Great combination of Gary speaking and visual representation. Very engaging. Let's go reinvent management ! Excellent presentation, we all could learn a lot from Gary, how to get our message over to the audience. My doubts are whether the message is really so valuable as what we would expect from such a reputable speaker. "zero-sum thinking, profit-obsession, power, conformance, control, hierarchy, and obedience don’t stand a chance against community, interdependence, freedom, flexibility, transparency, meritocracy, and self-determination"
I begin to believe, I luckily can share insights and experience with a rapidly growing community of people focused on to get all this principles to our management (or rather leadership) approach and even into our lives in general - and all that for at least for 1,5 year. Surprising also is Gary's support for web education - there is a substantial neuroscience support just for the opposite - there is a strong predisposition given by our brain requiring direct (not electronically vicarious) social contact at the EFFICIENT learning process - see for instance long term research of UCL Institute of Cognitive Neuroscience in London, UK, prof. Sarah-Jayne Blakemore or Kevin Ochsner research at Social Cognitive Neuroscience Laboratory Department of Psychology Columbia University and many others. Let's finally accept, that all human achievement and creativity comes actually from individual people and their thinking (i.e.their brains) to organizations, regardless the frequently changing "breakthrough" concepts which management gurus fabricate. Awesome. Watched twice. Thank you. Shared in three of my networks. Synapsing with Traci Fenton: Democratic Workplaces (TEDxMadtown). One suggestion: The designer lost the plot with these visuals. It look slike a toy that ran away with him. There'say too much happening and it's way too busy. It throws you off the message adn when it doesn't it seems to say that everything - everything is of equal importance. But visuals are supposed to emphasize the main themes rather than capture every word. The designer needs ti slow it down and relax. @GaryH: You are right about the management technology and its need to change. Interestingly enough, the management technology you are talking about is applicable only to the industrialized world with large groups of people under a corporate or government banner that has to produce stuff to satisfy its share holders or political boses. I am afraid the mega Military-Industrial complexes are no longer suitable for the future. The future is likely to be largely unorganized and spontaneous. Come to think of it; the title of your video, " the technology of human accomplishment" is in fact, a very small part of human accomplishment. The truth, if you think about it, is: human accomplishments have happened only at the fringes as you correctly mention in your monologue. Regarding "However, we need to start this at still earlier stages of the societal living with children going to schools and colleges." I believe the Montessori philosophy and method of education (innovative - still on the fringe after 100 years) is similarly designed and the resulting "product" is distinguishable. I believe the management style described is present in a Montessori classroom. The result is a person/student with a different perspective than the traditional schooled person. Change education, change the world. By Maria Montessori - "My vision of the future is no longer of people taking exams and proceeding on that certification from the secondary school to the university, but of individuals passing from one stage of independence to a higher, by means of their own activity, through their own effort of will, which constitutes the inner evolution of the individual." Great video. Thank you Dr Hamel. My observation is many large corporations and their management want “semi programmable robots” as G. Hamel stated, yet for the last 30 years, scientists have been trying to create a humanized robot. I don’t understand our obsession with re-engineering in this manner. Perhaps an object lesson in irony. An absolutely fantastic presentation with a very important topic. I think we need a lot of inspiring talks like this over time to really change things in the big coporations, but all startups and smaller companies has the option to make use of this. The mastodons may die, before they know what hit them! Thank you for making that video available, as all your others. I enjoyed the multi activity that matched my brain activity...very busy and engaging! Well done. "...profit-obsession, power, conformance, control, hierarchy, and obedience don’t stand a chance against community, interdependence, freedom, flexibility, transparency, meritocracy, and self-determination." In case you had any doubt, Kickstarter Comes of Age...http://bit.ly/xKk1p6. Make sure you watch the Double Fine video linked in the article. I am wondering when Kickstarter will go global. 1) "Knowledge Work" category includes creativity and innovation vs. mundane, passive stewardship. 2) Effective leaders create more satisfied employees; satisfied employees create more satisfied customers; satisfied customers create higher profits. 3) Managers motivate, leaders inspire. 4) Today's leaders do not "need the meetings", instead they "meet the needs". One piece that may be helpful to elaborate on (or do a separate video of) is that of "knowledge workers"- what are their characteristics and what do they value? Many of today's managers/leaders don't seem to value them and it may be because they don't know how to recognize these individuals, who tend to operate very differently. Best management presentation I have seen in a long time! Read Vineets Book and found it fascinating. Found his background presentation 1st class! It so successfully complimented his talk. 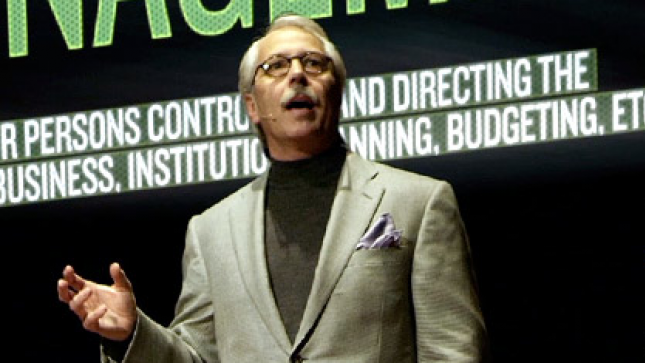 Modern management from our guy Gary Hamel, Ive been listening this guy and if you are wanting to start to build organization then this guy help you some useful tips, Of course you will not just learn from this guy, you need to study the possibilities of your future organization and learn from the veterans. I believe Gary Hamel have hit the important issue where everyone who aspire to have an effective organization. This is a good idea where you can start to analyze how to run your own organization with your own management and when you expand your endeavors and trusted the management to trusted personnel, you can still apply this principles and make a good and profitable organization. More power to Gary and his family. I love this information. WOW,,, I mean, this is one outstanding essay by Gary and the first I have watched since I am new to this website,, so inspiring and the most important thing for me is the part where he emphasized on existing knowledge and creating new knowledge..especially with fast growing of new technologies. people need to adapt to the new evolution if thats the right word...I also like the part where people bring their 'gifts of creativitiy/initiatives and passions'. I totally agree,,its about time for BIG change in the world of MANAGEMENT..having a variety of perspectives can develop something major which could lead to amazing innovation of human capital..in terms of HRM, if top management are well equipped with these created new knowledge and use them to their best advantages, the whole department will collaborate to make things happen. Thanks Gary, your insights are Lonnng overdue. The collaborative workforce is now shaping new management models and there certainly is no turning back. Globalization and shopping the planet for best price, service and provider is here to stay. Our task is to align, synergize, deploy, manage, monitor, support the best we have to offer in order to compete! Everyone in an organization needs to take responsibility for executing on their gifts, strengths, talents and passion and measuring their own performance religiously along the way. AMEN, Gary. I feel affirmed in my message over years and am advocating the read of your book, What Matters Most. I heard you speak at a smaller venue alongside Siemens and Burr Oak Tool. I was nodding a lot and am so aligned with the strong need to turn the hierarchical pyramid upside down and move from so much rhetoric to action based on our individual strengths and be responsible and accountable for its holistic fit. Appreciative Inquiry is a powerful tool to flatten hierarchal systems, become responsive to a shared vision...more efficient in its approach to answer the future requirements of fast creation, innovative placement. I am spreading the word and have been sharing your book as a place to start the conversation. It is rhetoric to turn things upside down because we are not taking the time to explore what it works like in the "numbers" that many are so focused on as the reason. Exceptionally insightful and creatively stimulating video. In my profession of educator and edupreneur, I am constantly challenged to break the mental constipation that has occurred in so many university and college professors, as well as the chairs, deans, provosts, and senior administrators the faculty work for. Your video has stirred me on to write a manifesto that I will publish shortly on my LinkedIn blog. I have chosen to help set the stage for continued and even more aggressive educational transformation. Changes in higher education is in its infancy; but is needed immediately in order to continue to transform the way individuals think about other individual, groups, teams, companies, spiritual beliefs, and countries. Moreover, new andragogies--(adult learning instructional strategies and learning models)--will monetize our capabilities to socially construct innovation, creativity, and design thinking. A great and very inspiring talk. I totally agree with Gary that things have to be done differently to get better result. It has been too long this is how it has been done and it has to continue or nothing. Organizations should give innovation a chance. The system has been too dogmatic and traditional so it has lost its bearing. I seem to associate Gary's kind of management style to Theory Y. What do you say to that? Colin Price: Are You Creating a Healthy Organization? Tom Malone: Why do we work? Deep meaning: What ideas do you stand for? Daniel Pink: What makes people tick at work? Colin Price: What is Organizational Health? Bill Taylor: Do you have the heart to win? Julian Birkinshaw: Mgmt 2.0 - Where Do You Start?